With styling and performance that splits the difference between the sportier Nissan Altima and softer Toyota Camry, the Honda Accord embodies the very balance that attracts so many buyers to the mid-size sedan segment in the first place. In terms of all-around quality and refinement, the Accord registers off the chart. 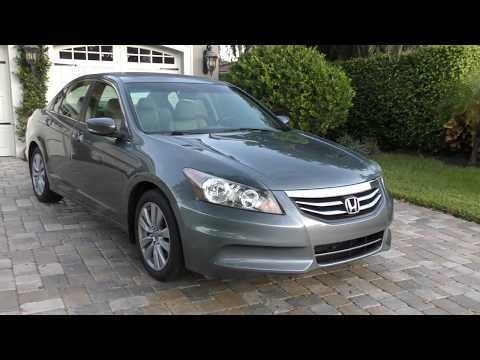 I love the performance, comfort, and style of my 2011 Honda Accord. My 2011 Honda Accord is a great car. It runs smoothly and drives great. I haven't experienced any problems with it. The only issues that came up were recalls that never affected the performance of my vehicle, but were taken care by the dealership. The maintenance on it is extremely minimal. I have only needed to take it in to get the oil changed and to change the fluids. It is also extremely durable. I drive to and from Atlanta everyday for work and have to drive on roads in terrible conditions. I ride over terrible roads and occasionally deep potholes that could potentially cause irreparable damage to any midsize sedan, but my vehicle has been able to withstand these conditions. That is a testament to the craft and expert workmanship that Honda puts into to their vehicles. It drives well in unfavorable weather conditions whether it is rain or snow. The configuration of the buttons and functions on the dashboard are simple and easy enough to learn and understand. The car is also extremely comfortable and being a fairy tall guy, that is very important. I can adjust the seat in any way that fits my comfort and that still allows me to safely and effectively control the vehicle. I also love the style of the vehicle. It is modern yet timeless. It is 7 years old, yet its style can still compete with 2018 cars. The Honda cars are long lasting cars. My car is very reliable, drives well I love my car. It is very comfortable, air condition works well, the heating works well we have our cold days. It has a nice sound system, it's good on gas. An Honda is one of the best cars you invest in. They are long lasting dependable. The seats are comfortable, travels well on the highway. Easy to change the radio station, I haven't had any problem Honda. I love when I get into my car and put your seatbelt on it locks the doors automatic. If you were to invest in an Honda your going to love it. My daughter an I both always buy the Honda cars. The Honda accord is a perfect vehicle for your average middle class driver. I love my Accord. It is comfortable in long trips because I can fine tune the seat with the many different adjustable seat functions. It rides smoothly and is quiet. It looks nice on the outside. I wish it came in more colors than gray. It is a sedan so it is convenient for transporting people and dogs. I like how the console is set up and also the buttons on the steering wheel. The ports inside the middle console for phone charging are difficult to reach though and the port in front shorted out.